Today, I received an email from a DMOZ editor, informing me that he found this blog informative have listed it in the most important directory and the most difficult one to get listed - DMOZ (Open Directory Project). You can find my blog listed here: Computers: Internet: FAQs: Help and Tutorials. And I didn't even submit my blog to the directory! (I have actually wanted to submit a long time ago, but I couldn't decide on what category to place it in. For submission to DMOZ, choosing the right category is important). I indeed feel greatly honored. The editor also inform me that many bloggers do not know about the basics of submission to DMOZ (Open Directory Project) and pointed me to a site providing tips for getting listed in the DMOZ Directory (Open Directory Project. Google uses the DMOZ listing and has a similar directory called Google Directory and an examination of the two directories showed that it has the same categories, but arranged in different order. You can find tips at Tips for getting site listed in Google Directory on getting faster approval of listing. Surf over there and read the useful tips before you try to submit your site to the most important directory. I do feel I deserve it. Just refer to the notes of appreciation and thanks I have compiled at Compilation of comments in Blogger and emails received (click BACK button to get back to this page). New Blogger: Adding graphic background to your blog Header (click BACK button to get back to this page). I have found another way to add a graphic header, however a test showed this to be an unsatisfactory way. See Testing adding graphic header. Maybe you can experiment to make the result acceptable, but I don't want to try as the above methods are well acceptable to me. (Note: You will see the blog text title together with the graphic. If you have incorporated the blog text title into the graphic and want to remove the blog text title, in the method described below, you can delete the text from the "Blog Title" field). I will be repeating this test again later when I have the time and either update this post or publish a new one. Also in the example above, you see the graphic extending beyond the boundary of the Header. If you don't want this to happen, you should resize the graphic with a photo editor or use the free and very good Irfanview as described in the post: Using Irfanview photo editor for your blog. Click BACK button to get back to this post. I will probably have to redo this post or do a new post to explain this method better). 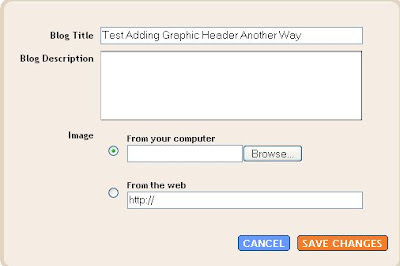 Click BROWSE and locate the graphic you have saved in your computer or type in the URL of the hosted graphic on the web. Then click "Save changes". I have written an earlier post on this subject: eMail Contact Form for Blogger (click BACK button to get back to this page), but the site that offered the contact form required me to download a program, which I was reluctant to do. In that post Amit suggested another alternative - Contactify where you don't have to download any program, but you will have to divulge your email address as well as the password. I was not willing to do this for my normal email address, so I created a new gmail address to test it out. I have in this way created a way for the blog visitors of Blogger Articles to contact me (at the new gmail address) without having to reveal that email address. The "email me" link to the contact form is at the bottom of the left sidebar of the above blog. Try it out, click on it and see what is the result. (Note: turned out that the password to to log into Contactify, and not the password to sign into your email Inbox). Update 28 April 2007: Shawn of Stock Blog Hub commented you don't need to give the password to your email address, but an email address to log into Contactify. I tested that by creating a gmail address, register with Contactify and gave my email address plus a password different from the gmail address to create the link. I copied the link, click a Add a Page Element and selected Link List to create a link to the Contactify contact form. You can see the link at the bottom of the left sidebar of the blog Career and You. Try clicking on that link and see what happens. I did that and found the responses were instantaneous. Today, something is going on with Blogger. Even when I am already signed in, whenever I attempt to get to the Dashboard, a pop-up appears which asked for the username and password, and foolishly, I gave my username and password. However, I think that that is a foolish and unneccesary thing to do because if you click the [x] (cancel), you will still get to the Dashboard. I am wondering if this is an attempt by some hackers to get our Blogger username and password for spamming, hijacking and other purposes. If you get that pop-up, my advice is to click [x] (cancel) and not give your username and password. Because I gave it the first time, I have quickly changed my Blogger (Google) password, and now I believe I can sleep better. Update 3 May 2007: Blogger Employee at the Google Blogger Help group have informed us the pop-up was from Blogger, but it had been fixed. He also assured that their username and password had not been compromised. However, I am still of the opinion that I did right in changing my password immediately as it is always better to err on the side of caution, especially when you don't have all the facts in front of you. Here is an example of a post which have a countdown clock with post title Countdown to Malaysia Vision 2020. I made it in response to a request from a member of the Google Blogger Help group. I thought I might as well make a post out of it so that more people will know about it. Thur has created 2 3-column New Blogger templates. One is a fixed width template and one a fluid width template. I will explain later, and also how you can observe the difference. into the address bar and press the ENTER key. The window will resize to 800 x 600. I hope you have a traffic counter installed for your template. It can give information about your visitors - from where they come from, what browser or Operating System they are using, if they got to your site, what search terms they used to find your site, the most popular pages, WHAT SCREEN RESOLUTION they are using. If a large percentage are 800x600, you may not like this template because part of your page will be hidden, and to see them, your visitors will have to scroll horizontally. Surfers are often lazy. Unless they are seriously interested in a site, if they don't see the hidden parts, they may not bother and surf over to other sites. This is the reason I use this Hackosphere 3 column New Blogger Minima template as 5-20% of this blog visitors are still using the 800x600 screen, and I don't want to discourage them from coming back. If you are reading this blog, you will probably see white spaces on both side, but not for 800x600 visitors who will find the content fit into their screen just nicely. Further there is this readability study mentioned in this post What is the best template for a blog (click BACK button to get back to this page), which says content corresponding roughly to the width are found to be more readable than wide column. If you are interested in installing such traffic counter like the one I used and which give me the kind of statistics I want without too much information, try Statcounter. Others use Google analytics which provide a lot of information including many pie charts which I found too much. But I think analytics would be good for those in e-Commerce an using AdWord for their advertising campaign. If you want Thur's DownRight v3.0 template, you can get it at DownRight v3.0 xml template. It is always wise to backup your current template before you edit or change template. Refer to Backing up and changing New Blogger template. Blogger do not backup all Page Elements (widget) and it is likely when you try to save the new template, you will receive the warning "Such and such will be deleted". If not already mentioned in the above post, let me repeat it will be a good idea to edit your Page Element one-by-one, copy the content of the Page Elements into Notepad files and save them. Then when you have changed to the new template, you can put back easily whatever is missing. It will be good if you have a browser with tabbed browsing like FireFox, then you can be in the Blogger page in one tab and in Thur's template page in another. First you will have to copy Thur's template at the download page (click on the page, press ctrl+A to highlight all the template, right-click and select "copy" to save it into clipboard. 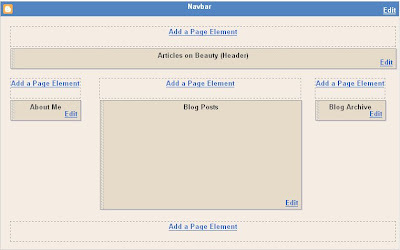 To change to the new template, sign into Blogger Dashboard, and in the list of blogs, click LAYOUT in the section for the relevant blog, then click the EDIT HTML sub-tab. This will open the template editor. Click inside the template editor window to highlight all the current template, press the "Delete" button. Then right-click inside the now empty template editor window, chose "Paste to paste what you have copied into clipboard from above into the template editor window. Preview, and if satisfied, click "Save template". into the address bar and press the ENTER key. Fluid width template has the advantage of the page automatically adjusting to a visitor's screen resolution, but you have to be careful when putting things like photos, scroll box, etc, to adjust the width to accommodate the 800x600 screen resolution users. Note the difference in the Google sitesearch box in the two blogs. In Weight Control Tips, I have to make the search box narrower as it uses the main column is fluid width, and wider search box will cause problems when viewed with a small screen (800 x 600) if I make it wider. If you want to use Thur's DownRight v1.4 template, you can download it here. The proceedure to change the template will be the same as described above. 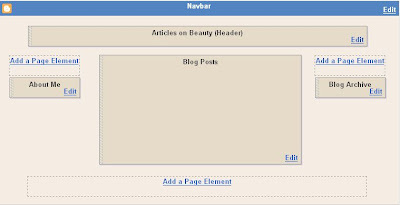 This blog uses Hackosphere 3 column Minima New Blogger template. If you want to know the reasons why, refer to What is the best template for my blog. and I am fine with it even though the email address do get harvested by email harvester and I do get spam. But gmail spam filter is so good all of them ends up in the spam folder, so it don't trouble me. However, if you are picky, you may want to create an email contact form for your visitors to contact you without revealing your email address. You can get it by going to Create a Contact Form for Blogger. I had originally intended to use it to demonstrate, but what I didn't like about that site was when I landed on the site, I got a message that IE7 blocked a pop-up which may cause security risk, and also the fact that one need to download a Webform Designer software which I didn't want to do. If you don't mind that, and you want a contact form badly enough, you can go to the above site which will give you a link to the page to download WebForm Designer, and if you don't want to set up your own script to email you the form's data, you may also be interested in our free form-to-email service. Update 29 April 2007: Here is an alternative for you if you have no appetite for downloading a program to get a contact form: eMail Contact Form Part 2 (click BACK button to get back to this page). Let's hope that these pages will also appear high in search engine result pages and bring more traffic to my blogs. Plus in the hub pages, I have created links to my blogs, and I suppose that will help in my PageRank. Hope over to Hub Pages to sign up for an account and create your own hub pages, and probably that will help bring more traffic to your blogs and increase your blogs PageRank. Alert: Problem with using Google group for hosting images for posts, etc. I prepared a post Uploading and manipulating images Part 2 (click "BACK" button to get back to this page) and used a Google group Photostore to host the photo. When I first previewed and published the post, the image appeared OK. Then for some reasons, I checked the post and found the photos to be replaced by blank boxes. I then proceed to upload the photo to My Photo Store - More cats in town, a blog created specially to host photos, obtained the URL of the photo as outlined in this post Getting New Blogger (formerly Blogger Beta) to host photos for the profile, sidebar, header, etc. (click "BACK" button to get back to this page). Now the photo appeared OK in the post. Now I would be much more careful about using Google group to host photos for my blog. Here are some 3 column templates for New Blogger by Isnaini, examples of which can be seen at Wedding Tips (using the Nyoba 780 template) and Money and Finance (Using the Nyoba template). Note that the graphic header didn't come with the template and you will have to make your own graphic header and save it into your computer for later uploading. When you first load the template, your blog Header will just be a blank grey rectangle, waiting for you to add the graphic Header. The templates can be downloaded from Free Templates. There are other templates available there, but they are old classic Blogger templates. To download the template, right-click on the "download" link and select "Save target as.." (wordings will be slightly different for different browsers), and then save it to a suitable folder in your computer. To change your template to the newly downloaded template, in the Dashboard, click LAYOUT. You will see a Layout like the screenshot below (click to enlarge). Yours will be slightly because I have added various Page Elements. What I want you to note is the PICTURE Page Element in the Header. Click Edit, then browse to the graphic header you have saved in your computer, then click "Save Changes". The Header for that blog is as I want it now. Save valuable above the fold space. Received a request to make "About Me" a single line which when clicked takes one to the full profile. This can easily be done. First you need to get the URL of your full profile. Sign into Dashboard and in the top right corner are details of your profile. 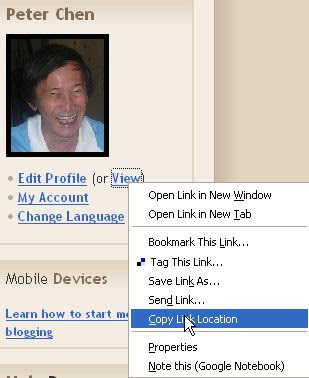 Right-click on the "VIEW" link and choose "Copy Link Location" to copy the URL of your full profile into clipboard. If you wish, you can open Notepad and paste it there in case it is cleared from clipboard, then you can get it from Notepad. I have also created another demonstration blog Alternative Medicine to demonstrate another way of doing it. The "About Me is also at the bottom of the left sidebar. Click on it and see what happen. 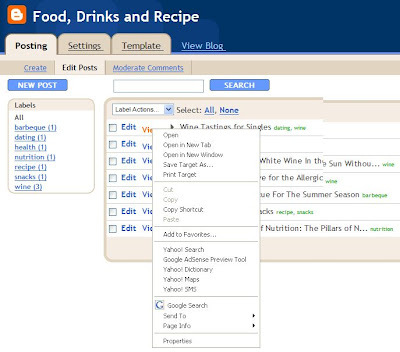 The bad news for him is that there is only a limited number of posts he can put in the drop-down menu, and I doubt that would be sufficient for his long list of recipes. However, I suppose this drop-down menu can still be useful for making drop-down menus like for blogs, etc. If he is still interested in doing it, this is how to proceed to generate the drop-down menu. 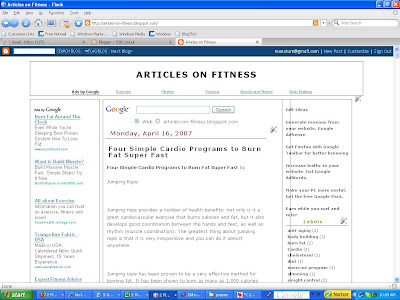 For this task, it will be helpful to use a browser like FireFox which have tabbed browsing. In one tab, log into the Blogger account and click "POSTS" for the relevant blog. A page with with a list of posts will appear. Right click on "VIEW" on one of the post and select "Copy Shortcut" to copy the post URL into the clipboard. Open another tab and surf over to Drop-down Menu Generator. Paste the URL into the "Link URL" field. Then type the title of the post into the field for "Text shown". Continue the same process until you have entered all the post you want to appear in the drop-down menu, or you run out of fields to paste the Link URL. Update 22 April, 2007: Phil provided an another drop-down menu (see comments). 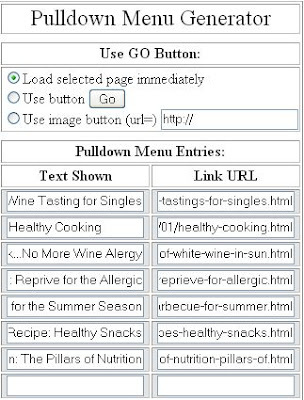 He gave a link to Drop-down menu creator by Hackosphere. I tried putting a drop-down menu on this blog Articles on Beauty. What you have to do is to provide a title for your drop-down menu, type the title of the link, the URL of the link, then click "Add Option". Make sure you don't click on "Add Option, or the link will appear more than once in the drop-down menu. To add another link, repeat above, and in this way, you can add as many link as you want - an advantage over the drop-down menu described in the post above. However, the drop-down menu width will expand with the text that you add, and it doesn't generate a script for you to paste into an "Add a Page Element" but add the widget direct into your Blogger account (you can choose the blog if you have more than one). Plus apparently, it add the widget to the first section in the template, which in the case of Articles on Beauty was the left sidebar. It ended up at the top of the left sidebar and was too wide for the sidebar. In the Layout, I tried to drag it to the footer, but for some reasons, the widget refused to be dragged. I had to delete the drop-down menu. There is further disadvantage. Even after deleting the pull down menu, Page Elements cannot be dragged and dropped. Looks like I will have to redo the whole template for Articles on Beauty again. Some of you may be Amazon Associate. Someone in the Google Blogger Help group asked on how to create an image of a book cover to link to an Amazon page for that book. The best way to explain is to show how I made that Digital Photography Book image in the bottom of the left sidebar of this demonstration blog Digital Photography Articles. Click go, and you will be taken to a list of relevant products. If you see a suitable product, click the "Get HTML" icon. You will be given 3 choices - text and image, image only, and text only. Since this post is about using a book cover image only, click the "Image Only" radio button and wait for a new page to open. There, there will be an image of the book cover plus the HTML to display it. If you use that HTML, you will have to save the image to your blog server, which in the case of blogspot user, is not possible. I don't use own domain and host with a third party web host, but if you are doing that, perhaps you may be able to use the HTML generated by ticking "Image only" by saving it to the server of your web host, but I am in no position to confirm as I use only blogspot and have no access to Blogger's server. 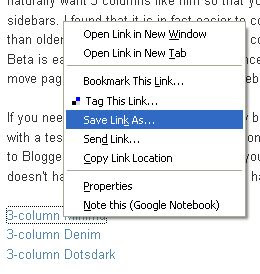 Highlight the link, copy and paste it either in the same or different NotePad for future use. Now you need an image of the book cover. Press the Printscreen key and open a suitable photo editor like the very good and free Irfanview (click "BACK" button to get back to this page). Paste it into the photo editor and crop the book cover image. Save it into a suitable folder in your computer. I saved it in a specially created "Temporary" folder which I can easily find. Actually, although I ticked the large image, for the book cover image I did for Digital Photography Articles, I actually didn't do it that way, but opened a new tab and went to http://amazon.com/ and made a search for "The Digital Photography Book" and printscreen there and pasted and dropped the image of the book cover as described above. This is because I wanted a larger image. Now you will have to host the picture on the web somehow. You can use Blogger as described in the post Getting New Blogger to host your image for the profile, sidebar, etc. (click "BACK" button to get back to this page). You can also use Photobucket or other third party photo host. I have actually posted it to a special blog My photo store: The Digital Photography Book for hosting the image. with the Amazon product link (URL) highlighted in red. Someone in the Google Help Group asked for ways to do the above. As it will be difficult to answer in the group, I have decided to answer the question in a post in this blog. Now, let's say you have a blog Digital Photography and you are an Amazon Associate. You want to put a link to a book in the sidebar. What you have to do is to sign into your Amazon Associate account, click "Build Links" and select "Text link". Actually the screenshot showed the correct field, but the URL and the description I put is not for a particular book, but for a search result. I believe text link to a particular book has a "shelf life", that is, you willl probably get a message "book no longer available" or something like that when the book goes out of print, or used books are not available. I prefer to link to something like a search result page. I have a demonstration blog Digital Photography Articles and for this post I am going to demonstrate a link to a search result page for "digital photography". I opened a third tab and surfed to amazon.com. There I typed in the search term "digital photography" and got a Digital Photography Articles search result page. Instead of an URL for a book, I thus have an URL for a search result page with many different products related to digital photography, and as long as Amazon has digital photography related products, this will never be a "dead link" and I don't have to worry about checking the link to see if it leads to a "product not available" message or something like that. I have published a previous post on Uploading and manipulating images in Blogger (click "BACK" button to get back to this page). This will describe using the <img> tag to display images. First you will have to host your images on the web. This can be done by creating and uploading your images to a Google Groups, or getting New Blogger to host your images (click "BACK" button to get back to this page), or use a third party free photo host like Photobucket. Once you have uploaded your image to the web, you will have to get the URL of the image ready. This post will describe getting the image in the midst of the text. A town called Kuching (cat) in the Borneo Island. A town called Kuching <img src="photo URL" align="bottom" width="48"> (cat) in the Borneo Island. A town called Kuching <img src ="photo URL" align="middle" width="48"> (cat) in the Borneo Island. A town called Kuching <img src ="photo URL" align="top" width="48"> (cat) in the Borneo Island. <img src="photo URL" width="48"> A town called Kuching (cat) in the Borneo Island. 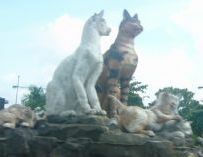 A town called Kuching <img src="Photo URL" width="48"> (cat) in the Borneo Island. Note that the attribute align="bottom" has been left out in the <img> tag. Update 17 April 2007: When I checked the post, the images were blank box, although when I first made the post, the images appeared fine. This perhaps was because the photo was uploaded to a private Google group. I thus reupload the photo to a blog specially created for uploading photos - My Photostore - More Cats in town, clicked on the image, and in the page containing only the photo, click VIEW > PAGE SOURCE and copied the real photo URL from the page source and replaced all the photo URL in the post. The image shoudl appear fine now. I have written a previous post How to get indent for your paragraphs" (click "BACK" button to get back to this page. It has worked for most, but a reader commented it didn't work for her and asked for an alternative. As I can't answer in the comment, I have to do a new post. Try using the tag in the first few of the paragraphs. I will take a screenshot of the post editor to show how I got the indent in the above paragraph with a screenshot (click to enlarge). and your new template will be saved into your blog template editor. which has only 3 "Add a Page Element" links. This blog (Blogger Tips and tricks) uses Ramani's modified Minima template, but was further modified by me to enable me to add things to the Header and the Main Column, plus make the width of the Header to be the same as the content of the blog. If you want something like this, I have uploaded the modified template and uploaded it to Photostore. The file name is Ramani's minima3col modified. Download that, save into a suitable folder, sign into Blogger Dashboard, click LAYOUT, then TEMPLATE, click BROWSE, select the xml file you just downloaded, then click UPLOAD. Update 15 April 2007: There were a few comments and emails about accessing that Photostore Google group as to get access, you need to be a member. Somehow, when I set up the group, Google set it to membership having to be approved by me. However, that should be no problem as I approve ALL membership. If ever you had your application rejected, it can only be a mistake, and all you need to do is to reapply again (hasn't happen yet). I thought I would leave it as it is as it is acting as a sort of hit counter for me as I get informed of how many people wants to get access to the group. Update 7 October 2007: I have received quite a few questions regarding getting error message (template cannot be parsed, etc). New Blogger is extremely fussy and sometimes we just don't know why we get error messages even when we are quite sure of doing the right thing. 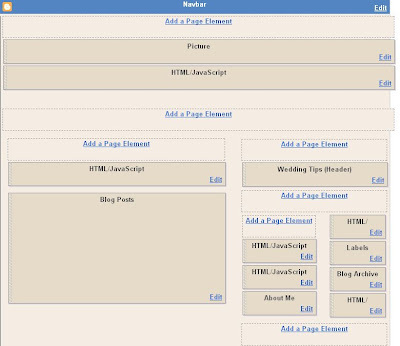 You can get the template for the wider Denim 3 column fixed width template by referring to New Blogger 3 column templates modified by Charlemagne Stavanger of Blogcrowds (click "BACK" button to get back to this page). There are lots of other 3 column templates, some with fixed width, some with fluid width (main column resize to fit screen resolution). There is a previous post New Blogger 3 column templates modified by Charlemagne Stavanger (click "BACK" button to get back to this page). However, the post is becoming very long, and the Dots template posted there has no Header. So here is a new post about another New Blogger template. This blog Alternative Medicine Articles is an example of Dots 3 column template for New Blogger that has a Header. It was modified mostly by Charlemagne Stavanger of Blogcrowds, but with some input from me. With Stavanger's permission, I put the template below for your convenience. The template has been modified to have 2 additional "Add a Page Element" - one for the Header, and one for the main column. With that modification, I have managed to put an AdSense link unit just below the title in the above blog, and a disclaimer plus a sitesearch box above the main column. <Variable name="textcolor" description="Text Color" type="color"
<Variable name="pagetitle" description="Blog Title Color" type="color"
<Variable name="posttitle" description="Post Title Color" type="color"
<Variable name="linkcolor" description="Link Color" type="color"
<Variable name="vlinkcolor" description="Visited Link Color" type="color"
<Variable name="sidebartitle" description="Sidebar Title Color" type="color"
<Variable name="pagetitlefont" description="Blog Title Font" type="font"
Search Engine Marketing is the term used to describe the range of marketing techniques required to make a website visible on search engines and directories so that it will attract visits from its target audience. This includes the optimisation of a site, the submission to directories, the use of 'pay-per-click' search tools and keyword related advertising. If you are into serious blogging, especially business blogging, and you want more traffic to your blog, you will take search engine marketing seriously. It will involve efforts in getting inbound links to increase link popularity, optimization, submission to directories, etc. All this involve time and effort. evisibility search engine optimization campaign offers a free site analysis if you want to find out how your site is faring. I submitted my site for analysis, and got a blank page, with the word "done" in the task bar and the URL http://www.evisibility.com/mailer.php in the address bar. So I suppose this is human operated and I will have to wait for my report. There is also a controversy over which is better - CPC (Cost per Click) or SEO (Search Engine Optimization). The first is fast, cost money and is only for a limited period of time, that is, it will bring traffic while the CPC campaign last. The second takes time to show results, is free if you do it yourself and is able to get free inbound links, but cost money if you let professionals like e:visibility do it for you, takes more effort but is beneficial over a longer term. e:visibility also have a blog with a post comparing the two at CPC or SEO: Which is better.